Brothers and sisters, the key to an understanding of the magnificent Auto-Lite strike in 1934 is that it was a strike won on the picket line by a community uprising. I repeat: on the picket line by a community uprising. Toledo was in the grip of a tremendous popular upsurge of anger at the greedy bosses who have to give their wage slaves a few cents more in their pay. This was 1934 B.T. – B.T. meaning before television. As a matter of fact, it was before all the social gains when we fought for and won in the ‘30s – before unemployment pay, before food stamps, before social security, before the CIO, and before Medicare, etc. After four years of depression, the Toledo workers were in an angry mood because of the bank failures, the idle factories, the over-stocked granaries, and the 15 million unemployed. For four years we had poverty in the midst of plenty. Even the establishment was losing confidence in themselves and their system. I don’t think (as James P. Cannon once pointed out) there was any real difference between the Toledo Auto-Lite strikers and the workers involved in many of the lost strikes in the United States at that time. In practically every strike, the rank and file always displayed courage. The difference was in the leadership and their strategy and tactics. In nearly every strike the militancy of the rank and file was muzzled, many times snuffed out from the top. The leaders are tricked by the courts, the labor boards, the mediators, the government, and the media to shift the fight from the picket line to the court and conference room. But all the while, the company keeps hiring scabs to take the strikers’ jobs. In the Auto-Lite strike, the company was hiring scabs by the hundreds and claimed they now had 1800 workers. We understood what was happening. We knew that the strike was dying and doomed. Only some bold, dramatic action could revive it, and even then it would have to be followed up with plenty of action and support to give the company an all-out fight. And nothing short of an all-out fight would do. As you probably know, we wrote a public letter to Judge Stuart telling him that we were going to violate his anti-labor injunction and call for mass picketing. By mass picketing we didn’t mean a few hundred, we meant thousands. Could we get thousands down to that picket line? Well, that was the $64 question. We had spent the previous year organizing what some qualified observer said was the largest and most militant unemployed organization in the country – the Lucas County Unemployed League. We had held meetings and spoke in every section of the city and in the townships; organized countless marches, demonstrations, sit-ins; stopped evictions; won cash relief with a relief strike; and had held many, many other actions. Because of this vast experience, we felt sure that we knew the temper of the Toledo workers. We felt we had a good chance to be the fuse that could ignite a spirit of solidarity with the Auto-Lite strikers to get union recognition and perhaps even win the first union contract in the auto plants of Toledo. On the first day that we violated the injunction, our mass picket line consisted of four individuals. That’s right – just four. We were arrested, jailed, convicted and let out on bail and warned not to return to the picket line. But we told the judge that we were going back. And we did – picking up some 50 pickets on the way. After that, there were a series of arrests, each one with a greater amount of pickets – first 46, then 108, and in between many smaller numbers. Every time we went back from the courts and jail, the picket lines kept growing steadily until on May 23 there were 10,000 reported on the street in front of the plant. Now when you have a mass picket line of thousands, it enables you to counter the company’s offensive moves. For example, they brought out a high-pressure hose and turned a stream of water on us. But it didn’t take very long for a couple of hundred pickets to take the hose away and turn the water on them. Many times the police and deputies brutally clubbed the pickets; but before they could shove them into a patrol wagon enough pickets rushed in and grabbed the pickets away and often gave the cops a taste of their own clubs. You know that every good union has two educational committees: one to arrange lectures of all kinds and the other to educate scabs who won’t attend classes. Half the employees at the Auto-Lite were women who were among the very best strikers we had. A couple of days after the National Guard came in, the women grabbed a scab, took him into an alley, and stripped every bit of clothing off of him except his tie and shoes. Then they marched him, naked as a jaybird, up and down the downtown streets. Next day the papers carried a large picture of him on the front page, but they had their artist broaden and lengthen the tie to hid the family jewels. You can bet that picture discouraged a lot of scabs, but it got a big round of applause from the unionists in Ohio. 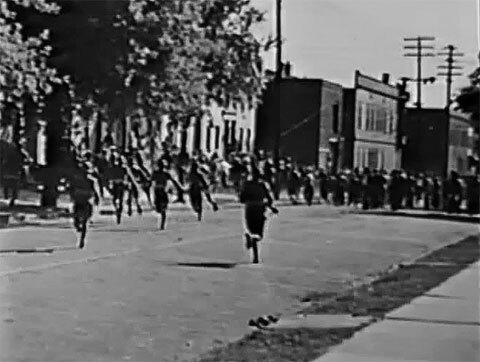 The Auto-Lite strikers battled first the police, then the company guards and deputies, and finally the National Guard. The first day the Guard came in they fired without warning at the unarmed strikers, killing two and wounding 25. After those murders, the enraged strikers fought the guard for six days and nights – returning again and again to face tear gas and vomit gas, bayonet charges, and even rifle fire. During the lulls in the battle, we stood on boxes educating the guardsmen about the issues in the strike and how they were being used against the workers. By the way, the casualties were not all one-sided. The hospitals were patching up not only strikers but police, deputies, and the National Guardsmen. On June 4, the company surrendered and signed on the dotted line a union contract giving the strikers priority on jobs, a 5-percent wage increase, and other concessions; agreed to withdraw all court charges and to pay all court costs. The logjam in Toledo had finally been broken, and 19 auto plants were organized before the year ended. The road was cleared to make Toledo a union town. As a participant in the Auto-Lite strike of 1934, I appreciate this opportunity to join with you in this 50th anniversary celebration. It is a credit to all of you who organized this anniversary to keep alive the memory of labor’s untapped strength as demonstrated in the Auto-Lite strike and all the other battles which prove that in unions we are strong. Below is the letter that the Auto-Lite strikers sent to Judge R.R. Stuart to inform him of their intention to violate his injunctions against picketing. On Monday morning May 7, at the Auto-Lite plant, the Lucas County Unemployed League, in protest of the injunction issued by your court, will deliberately and specifically violate the injunction enjoining us from sympathetically picketing peacefully in support of the striking Auto Workers Federal Union. We sincerely believe that this court intervention, preventing us from picketing, is an abrogation of our democratic rights, contrary to our constitutional liberties and contravenes the spirit and the letter of Section 7a of the NRA. With full knowledge of the principles involved and the possible consequences, we openly and publicly violate an injunction which, in our opinion, is a suppressive and oppressive act against all workers. Love it, read of it before. I don't want to sound like a nancy, but how do we achieve without the bloodshed? How do we get mass action of the workers on such a scale without a body-count. Remember its us who dies. The more they kill of us, the more violent they say we are. We are dealing with psychopaths who think nothing of killing us; but we preclude ourselves of killing them. How do you fight such an a-symmetrical battle? In Cleveland, Jewish butchers were the first to organize into the Amalgamated, and Sam Pollock, who had led two radical strikes (auto-parts workers and onion pickers) during the middle years of the Depression, became a militant organizer, and president of of its politically active District 427 in 1952. By the time of his death in 1983, Pollack had accumulated one of the largest private collections of books and materials related to labor and political radicalism in the country. The Amalgamated absorbed several major unions before merging with the Retail Clerks International Union to form the United Food and Commercial Workers in 1979.